Nintendo of America has released the fifth Nintendo Power Podcast episode, which is now available on SoundCloud, iTunes, and Google Play Music. The podcast continues to be hosted by former Nintendo Power editor-in-chief Chris Slate, and, in this episode, he is joined by Samantha Robertson and Todd Buechele from Nintendo Treehouse. 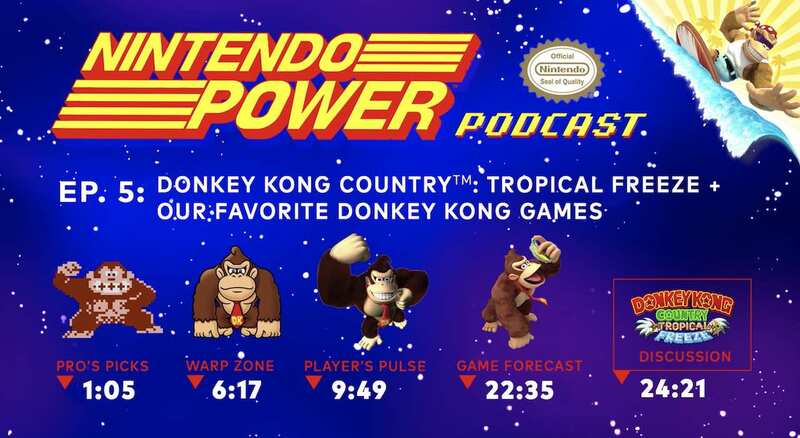 They talk about the changes made to Donkey Kong Country: Tropical Freeze on Nintendo Switch, and all the usual episode parts – Pro’s Picks, the Warp Zone game quiz and Player’s Pulse listener questions – are all dedicated to the big ape. Donkey Kong Country: Tropical Freeze is now available exclusively on Nintendo Switch and Wii U worldwide.